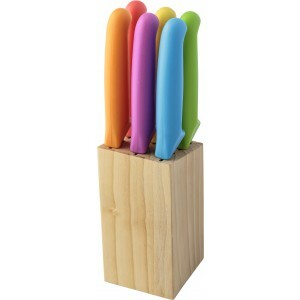 Stainless steel seven piece steak knife set; includes six steak knives with coloured PP handles in a rubber wood block. 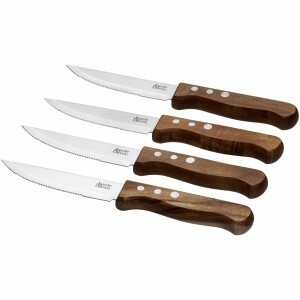 Main 3-piece knife set. 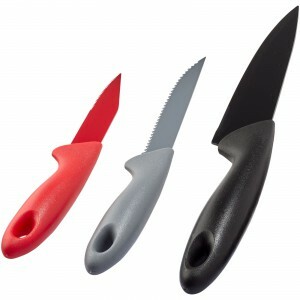 Three piece knife set includes a chef's knife, serrated knife and paring knife. 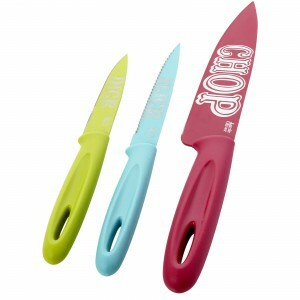 Blades have a non stick coating which allows the cut ingredients to easily slide off the blade. Presented in an Avenue gift box. Stainless steel and plastic. Funky Knife Set. 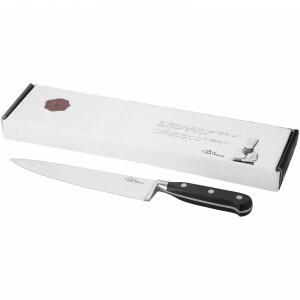 Set includes 15cm chef's knife, 11cm serrated knife and 8.5cm paring knife. Durable coating, dishwasher safe. Supplied in a Jamie Oliver gift box. Exclusive design. Stainless steel. Essential chef's knife. An essential item for every chef. 8" Stainless steel blade with ABS handle. 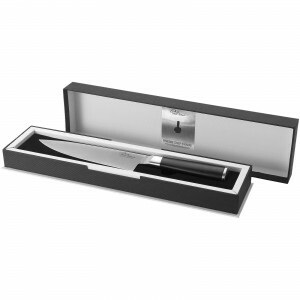 The knife is presented in a Paul Bocuse gift box. Exclusive design. Stainless steel and ABS.